AMD's CPUs can't compete with Intel's when it comes to processing power alone, but when it comes to integrated graphics, the situation is a bit different. Our today's weapon of choice is AMD's Trinity A10 5800K with HD 7660D graphics engine, which has 384 shader cores. The same embedded GPU is a part of the A10 5700K. In its core, the HD 7660D is much like the discrete GPU. Memory bandwidth is important factors for performance but since the embedded GPU depends on system momory, the bandwidth will depend on system memory speed. 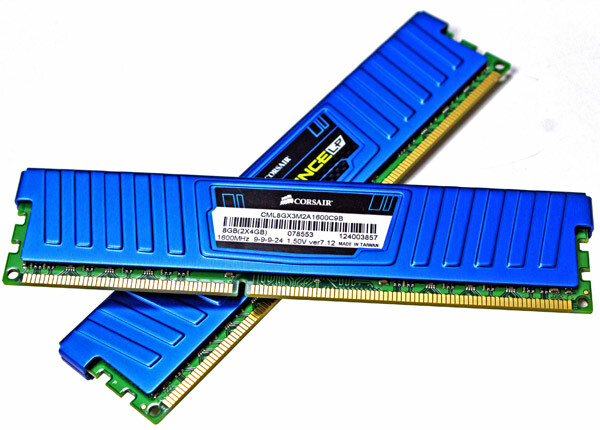 Today we will look at Corsair's 8GB kit, precisely Vengeance LP CML8GX3M2A1600C9B memory. This set, which consists of 2x4GB modules, goes for only €35. Speed is rated at PC3-12800 (1600 MT/s). The Vengeance LP kit arrives safely boxed in a transparent plastic blister which is packed into a small cardboard box that features a big image of the module on the front side, and a small window on the back for a better presentation of specifications. 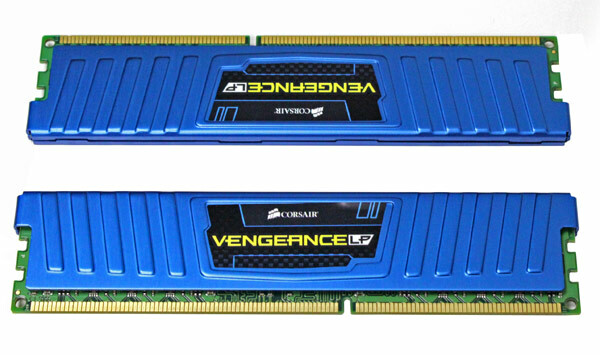 Corsair Vengeance LP DDR3 memory is equipped with Low Profile heat spreaders which have a reduced height of 1.03" (26.25mm) compared to normal Vengeance. They're designed for high-performance systems with extra-large CPU coolers, small form factor system builds, or any other space-constrained application where standard Vengeance memory might not fit. You can find this module under code name CML8GX3M2A1600C9B. Letter B at the end is for the color name (other possibilities are Special Edition Arctic White and Jet Black. It is designed to operate at 1.5V. The Special Edition Arctic White models operate at the ultra-low voltage of 1.35V. Each module is flashed with SPD that provides basic information. 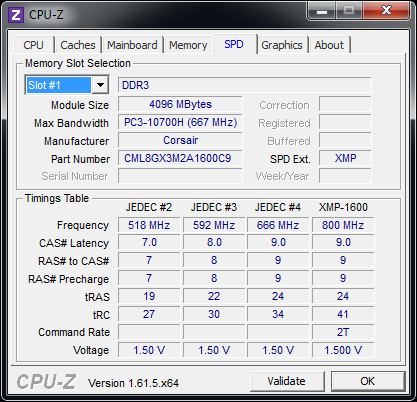 Intel Extreme Memory Profile (XMP) is recognized by both the BIOS and CPU-Z. If you notice that the memory is running slower and you're not the overclocking type, just enable XMP in BIOS and it will automatically select the right settings. 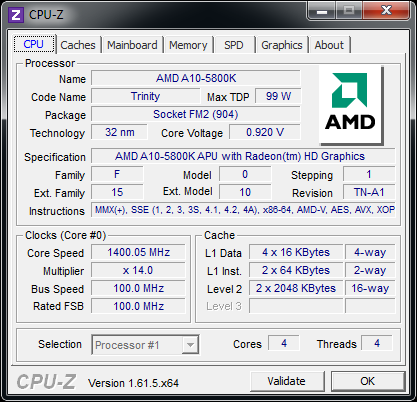 For all tests we used AMD A10-5800K with HD 7660D graphics engine. From the whole 8GB of system memory IGP got only 512MB. This memory was allocated by system and we did not have influenced this. 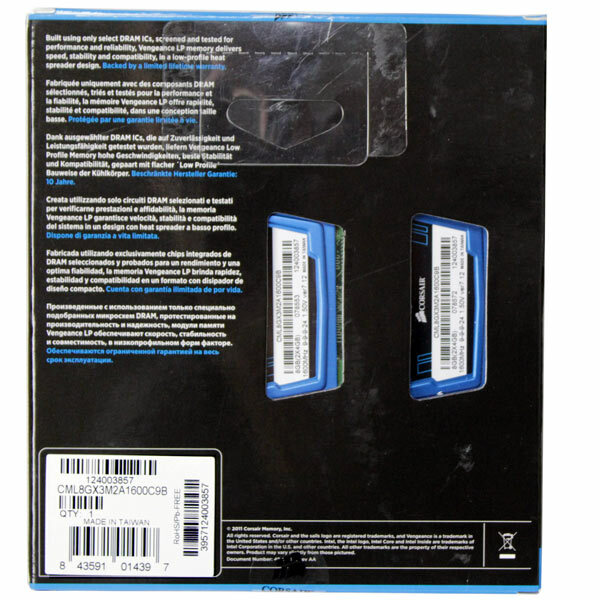 IGP memory speed mirrors system memory speed. If you wish to increase memory bandwidth, and in turn IGP performance, we can do that by overclocking system memory. AMD advises users to use system memory running at 800MHz, or up to 993MHz, which is the official maximum supported AMD's APUs. 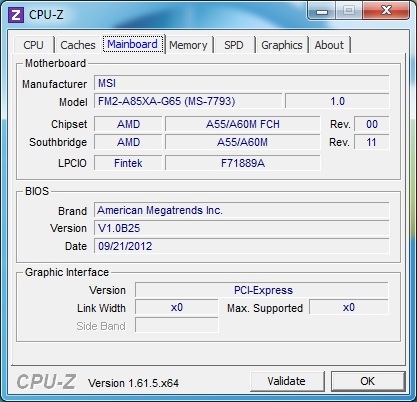 GPUZ screenshot confirms that CML8GX3M2A1600C9B works at 800MHz (1600MHz DDR3). As you can see, the results of memory overclocking show on the bandwidth numbers. This benchmark measures the typical delay when the CPU reads data from system memory. Memory latency time means the penalty measured from the issuing of the read command until the data arrives to the integer registers of the CPU. The code behind this benchmark method is written in Assembly, and uses 1 MB alignment, 1024-byte stride size. Memory is accessed in forward direction. Memory Latency benchmark test uses only the basic x86 instructions and utilizes only one processor core and one thread. We can't confirm this but AIDA64 discussion forum leaked a piece of info claiming AIDA64 will soon completely drop all current memory benchmarks. SiSoftware Sandra (the System ANalyser, Diagnostic and Reporting Assistant) is a 32 and 64-bit Windows system analyser that includes benchmarking, testing and listing modules. It tries to go beyond other utilities to show you more of what is really going on under the hood so you draw comparisons at both a high and low-level in a single product. Any significant memory boost quickly shows on bandwidth numbers, up to 6 or 7 percent on our tested speeds. 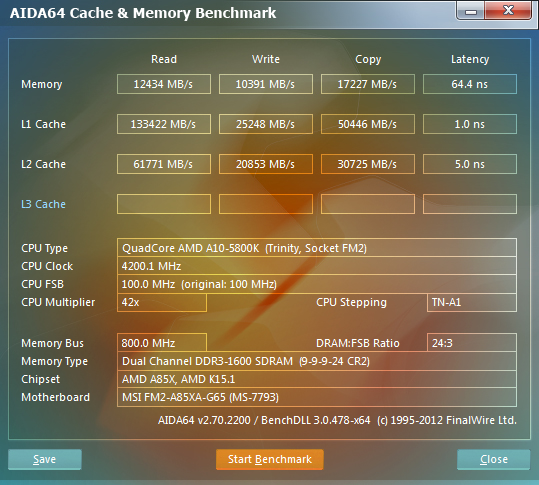 Overclocking the memory from 800MHz to 933MHz improved the gaming scores up to 14 percent. This number is closer to 30 percent when you compare 666MHz and 933MHz memory. Overclocking the memory from 800MHz to 933MHz improved the gaming scores up to 8 percent. This number is closer to 18 percent when you compare 666MHz and 933MHz memory. 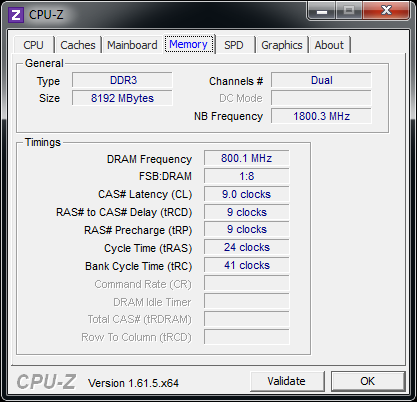 Overclocking the memory from 800MHz to 933MHz improved the gaming scores up to 14 percent. This number is closer to 17 percent when you compare 666MHz and 933MHz memory. 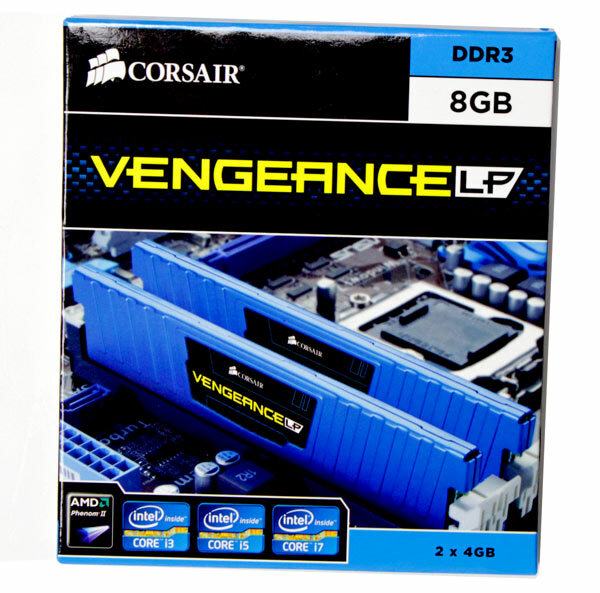 Vengeance LP Blue 8GB kit launched more than a year ago at €50, but can now be found at €35. We're talking about memory that is tested and known to work at 800MHz (1600 MT/s), as well as overclockable to 933MHz (1866 MT/s). Low profile, i.e. standard heatsink, is another plus for this kit because it enables placing the memory underneath low CPU coolers, which are mostly found in HTPC systems. This kit can be very interesting for AMD APU owners. Today we showed that memory clock plays a significant role when it comes to IGP performance. Of course, passionate gamers will still rely on dedicated graphics cards. However, if occasional gaming is all you do, then AMD's APUs may very well be all you need. If we lower image quality settings in games, depending on the game and resolution, we can end up with playable frame rate.